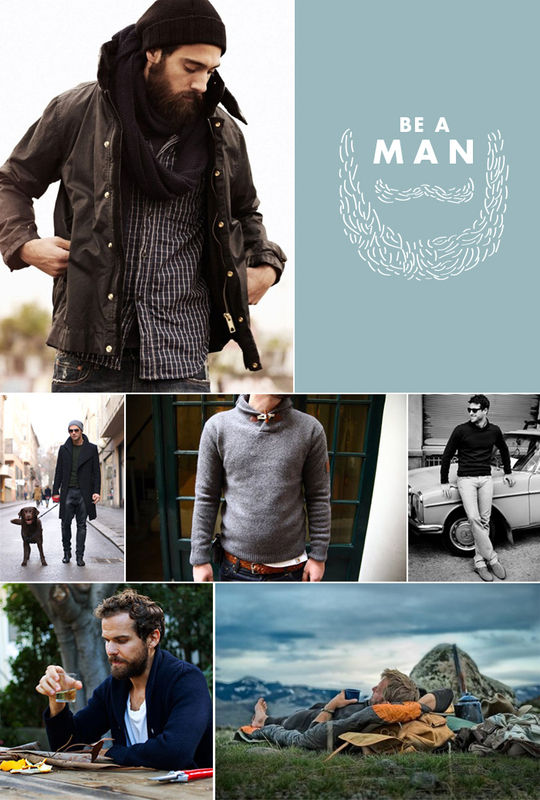 I am all about the manly man. I mean we are talking smells like a campfire, smokes a pipe, wears slouchy hats, and drinks whisky but goodness does he know how to wear a cardigan. I know I don’t take enough time to share my love for the modern man and Mike has been telling me I need to share more man things simply to inspire him if anything. Well here we go more manliness for the blog. Now don’t get me wrong I love myself a man in a clean suite with a black skinny tie and looking sleek, but on an everyday basis I think a man should be a man gosh darn it. I honestly love seeing a man that embraces the loose hair, a good beard, and the rawness that is who a man is naturally. Think Jcrew mixed with the classic lumberjack from the local thrift shop. These men know how to cook but not too fancy and with natural from the garden elements that speak for themselves. He has a dog that has an independent soul but loves being by his owner’s side because they are secretly soul mates. He always has a bottle of scotch but appreciates a good Chardonnay when the occasion calls for it. He has the basics in his closet and knows when to add something to spice up the outfit. He has a tough front but those still waters run deep with great compassion and thoughtful reasoning. He knows he can always lead but knows when to let his woman to be in front and let’s her call some shots too. I plan to lay out today the essentials for a man to have in his closet. For men it is much simpler than for women but still important for a man to know what needs to be there. Most any store will carry these items but they are best to purchase quality so they wear well and hold up to all the manly adventures you know you are going to have out there in the world.